Audio-Technica have added multiple polar patterns to one of their already successful designs, bringing increased versatility in the studio. This interesting monitor system uses the natural roll-off of the satellite speakers to provide the crossover with the subwoofer. The duo behind Cinematique Instruments have been composing music for films and documentaries for 10 years and have more recently extended their talents to the sampling of rare and strange instruments. This set of 40 hip‑hop backing‑track construction kits is the work of producer Soul‑G and includes Apple Loops, Acidised WAV and REX formats. Test plots to accompany the article. Hugh Robjohns checks out another offering from Black Lion: the new passive summing mixer, PM8. Paul White investigates a new effects pedal from Electro Harmonix... everybody Freeze! The Flip Ultra HD promises high-definition video recording in the palm of your hand — but does it live up to the claim? Mackie's Blackjack is the smallest interface yet to feature their acclaimed Onyx mic preamps. The KRP1 Krautrock Phaser is a modern recreation of a German classic. Thought you'd seen the death of the large-format console? Think again, as you read our exclusive preview of this modern take on classic Neve designs. Dance Drum Samples is a bargain‑priced sample pack available to download from Original Music. It's a healthy 658MB in size and contains 116 WAV loops, of which 103 are presented in REX 2 format with accompanying MIDI files. Symphobia's sequel probes deeper into the psyche of the sampled orchestra. Virtual bassists are not short of options for looking after their low end. How does this new one fare? Stacked humbucker pickups designed to replace standard single-coil pickups are nothing new, but most simply strive to deliver a single-coil tone while offering the noise-suppression ability of a humbucker. The latest version of Vegas offers plenty of professional features at a competitive price. So can you expect compromises in performance, or is Vegas Pro a spectacular deal? Steinberg's Wavelab has spread its wings to become the only truly cross-platform stereo editing package — and in the process, it's undergone a comprehensive makeover. Electric guitar is one of the most difficult instruments to recreate in sample-based form. Sugar Bytes are the latest developers to brave the challenge. Dave Lockwood delights in changing colours as he tests out this multi-port adaptable power supply from T-Rex. Sanctify your soundtracks with Tonehammer's new choral library. I first saw Vocaloid demonstrated by Yamaha at the 2003 Frankfurt Musikmesse, and even though the chap presenting the demo spoke few words of English, the product's impressive capabilities were obvious. We show you the most modest of feats: a wonderful way of repeating your beats. Whether you're an experienced or a novice Logic user, going back to the beginning might show you a thing or two. Make light work of song arranging with Reason's new Blocks feature. DP's latest version brings the ability to change the look and feel of the program. We find out how, and explore other additions in DP 7.2. Apple's iMovie may be designed for making slideshows of snapshots and holiday videos, but what's to stop you thinking outside the box? In the first of this two-part series, we look at the best ways to manage your day-to-day backups in Sonar.Read Part 2. Discover the power of Reaper's EQ plug-in and become an EQ master in the process. Even a handful of knobs and sliders on a MIDI master keyboard are enough to give you hands-on control of your Cubase mix. We spend a lot of time rescuing sub-standard recordings and arrangements in Mix Rescue, but this month it really was all about mixing and mastering. These audio files accompany the Mix Rescue article that featured in SOS December 2010. With over 50 Studio SOS visits under our belt, we thought it was time to discuss some of the most common studio problems we've tackled. Pro Tools' rulers not only show the passage of time, they allow you to control it! Don't panic if your iDevice has recently gone to a watery grave; your music may still be salvageable. Alex Marten: Is Music Meaningless In Isolation? Is music meaningless in isolation? Read more about Alex Marten: Is Music Meaningless In Isolation? Paul White muses on the art of sound and recording. Mike Vernon produced some of the greatest blues records of all time. A full decade after retiring, he's back in the studio with some of the British blues scene's brightest lights. With country guitars, what you hear on the record is what was played in the studio. We asked Nashville's leading engineers how they capture those tones. It's 10 years since the groundbreaking Melodyne audio-processing software was launched. To celebrate, its inventor Peter Neubäcker invited us into his research lab to talk about possible future developments. Thirty years after Led Zeppelin ended, Robert Plant has reached a second career high. His latest hit album was tracked and mixed by Mike Poole, using a mouth-watering selection of vintage equipment. If your laptop's giving you ground-loop problems, maybe it's time to go back to battery power... Martin Walker discusses this, and rounds up the latest PC news. Q. Does freezing really improve the quality of valves? Read more about Q. Does freezing really improve the quality of valves? Q. How can I improve the sound of my DJ set when mastering? I'm a drum & bass DJ and I work exclusively with vinyl, which is all mastered for a club sound system. Read more about Q. How can I improve the sound of my DJ set when mastering? Read more about Q. What's the best order for recording a band? Q. What's the best way to back up my data? Read more about Q. What's the best way to back up my data? Q. Why does using a high-pass filter make things seem louder? Read more about Q. Why does using a high-pass filter make things seem louder? The only way to make money as a media composer is from publishing — but greedy production companies are targeting our back end with a vengeance. 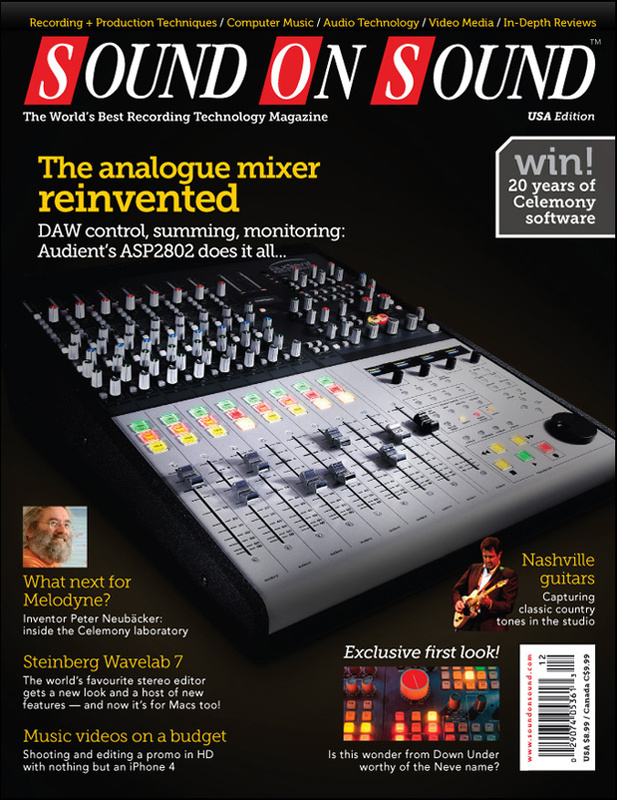 Media content for the December 2010 issue.